March 24, 2019, Adrian, Michigan – The Adrian Dominican Sisters Motherhouse Campus celebrated National Catholic Sisters Week (NCSW) by reaching out March 14 to local Partners in Mission – Motherhouse Co-workers, Siena Heights University Torchbearers (faculty and staff members who are specially trained in the Mission of the Adrian Dominican Sisters), and tutors of Adrian Rea Literacy Center. Begun in 2014, NCSW is recognized March 8-14 to shine a spotlight on the commitment and ministries of U.S. Catholic Sisters. Adrian Dominican Sister Mary Soher, OP, was instrumental in this initiative. 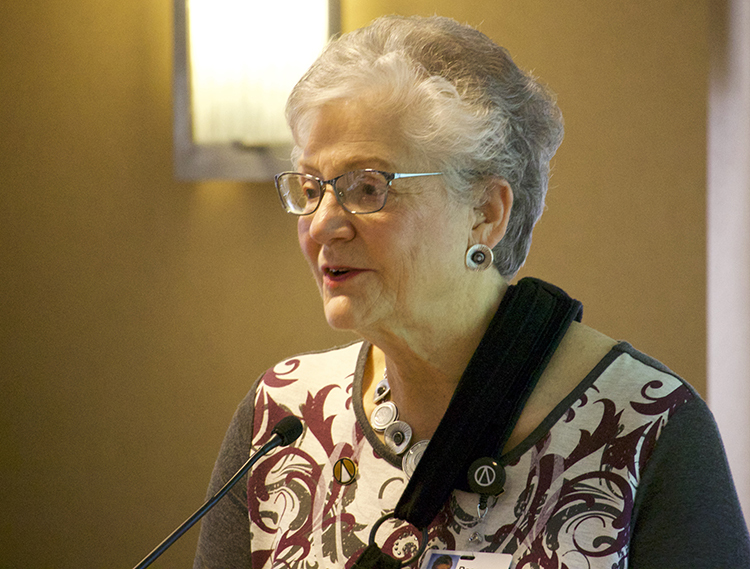 Sister Rosemary Abramovich, OP, Co-chair of the Motherhouse Campus National Catholic Sisters Week Committee, welcomes Partners in Mission to the program. In recent years, the Adrian Dominican Sisters marked the week with special outreach programs to the Adrian area community. 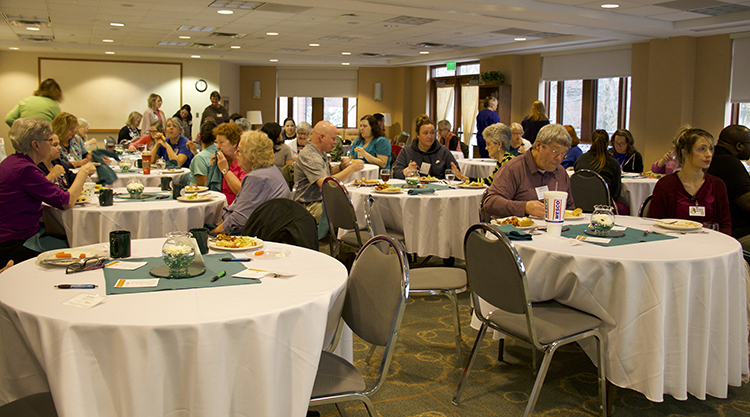 “This year we decided to bring [the NCSW celebration] closer to home with all of us on Siena Heights Drive,” said Sister Rosemary Abramovich, OP, Co-chair of the Campus NCSW Committee. The Committee invited Torchbearers, tutors, and Sisters to the March 14 Mission Retreat, a program presented four times throughout the year to help the Congregation’s new Co-workers become more steeped in the Mission of the Adrian Dominican Sisters. 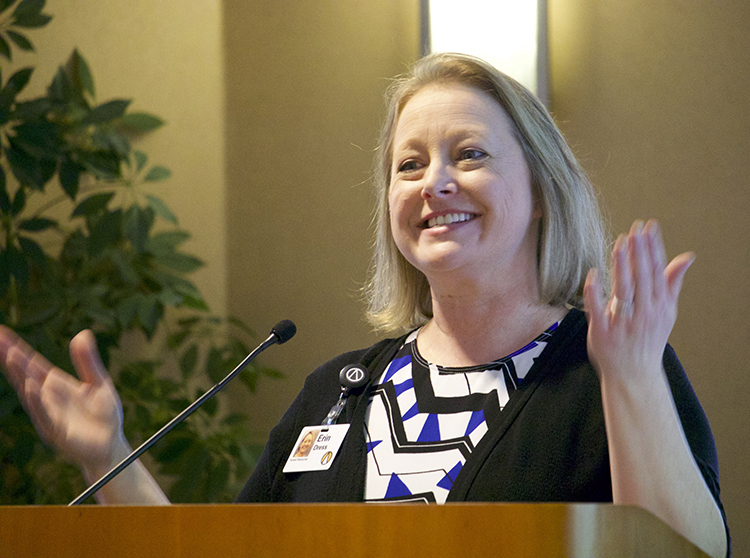 “The Mission Retreat is all about what our partnership means,” explained Erin Dress, Director of Human Resources. Sister Esther Kennedy, OP, traced the Congregation’s history from St. Dominic’s original mission in 13th century Spain to combat the heresy that creation is evil and only the spirit is good. He founded the first convent of Dominican cloistered nuns in 1206 in southern France, which, in turn, ultimately founded 11 other convents for women. The Adrian Dominican Sisters trace their history to one of those convents: Holy Cross in Regensburg, Bavaria, Germany, which sent four Sisters to the Americas. “The seeds of St. Dominic scattered across the ocean, landed in New York, and soon spread to Michigan,” Sister Esther said. The foundation of Sisters who originally came to Adrian to serve at St. Mary and St. Joseph Parishes eventually grew. In 1885, the community became a province of the original New York foundation, and in 1923 became a separate Congregation of Dominican Sisters. Erin Dress, Director of Human Resources, introduces participants to the Mission Retreat. Sisters Peg O’Flynn, OP, and Carleen Maly, OP, shared their own call to the Mission as Adrian Dominican Sisters. Sister Peg said that many of her family members served in religious life and that she was pleased to enter the Adrian Dominican Congregation. She currently serves as the Congregation Fleet Coordinator in the Finance Office and as interviewer for a series of videos, Our Dominican Lives: A Sister’s Story. Sister Carleen, Director of the Adrian Rea Literacy Center, recalls hearing a message from God, “Be for more people,” and entering the Congregation in response. Motherhouse Co-workers, Siena Heights University Torchbearers, and Adrian Rea Literacy Center tutors gather with Sisters for a lunch and program during National Catholic Sisters Week. 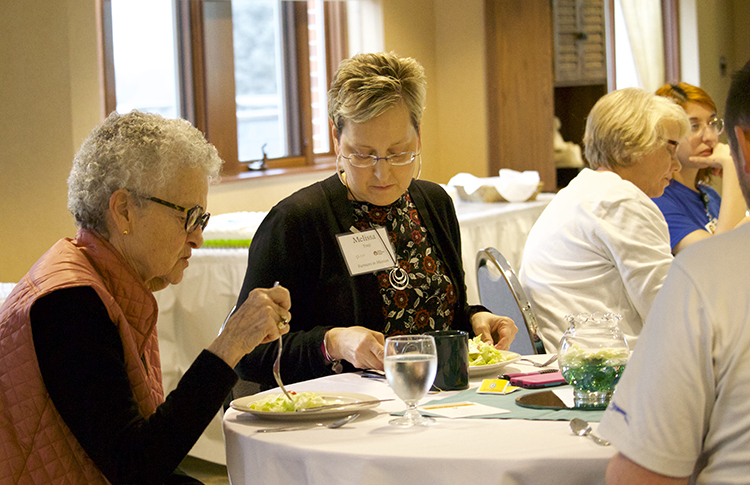 Several participants in the NCSW program recognized their own call to the Mission. Tina Adams sees her role as tutor at Adrian Rea Literacy Center as “giving back. I see tutoring as part of the mission, making the adult learners more comfortable and familiar with our language.” She said she appreciates the many opportunities that the Sisters give to the adult learners and others in need. Tim Tracy, who works in the Technology Department for the Congregation, said, he sees the Mission in action as he assists Sisters, listens and shares his own knowledge of technology. Read more about how you can become a Partner in Mission as an Adrian Dominican Sister, Associate, or Co-worker. Feature photo (top) Sister Patricia Harvat, OP, General Councilor, welcomes the Adrian Dominican Sisters’ Partners in Mission to a special program for National Catholic Sisters Week. Sounds like it was a wonderful event. Thanks for all the planning.